The term “scope” is the shortened version of the term “telescopic sight”. In the early history of firearms, guns had only iron sights. These were basically little spikes of metal, or a metal bead, at the end of the barrel of your gun that you could line up with your target in order to aim effectively. Of course, with a smooth bore flintlock-musket, firing round shot, you only had a general idea of where your projectile was going regardless. Then came the rifled barrel and the invention of the Minié Ball, a torpedo shaped projectile that is the predecessor of the modern bullet. These projectiles increased the effective range of firearms by literally hundreds of yards. They allowed a good shot to deal death at a distance. It was around this time that the scope really came into its own as a firearm accessory. Before the rifled barrel there was no need to see a target that was far away, because there was no chance of ever hitting it. The rifled barrel changed that and the evolution of the scope began. In its most basic form a scope magnifies light to make objects look closer than they appear. Most modern scopes include a crosshair pattern that the shooter uses to align the firearm to the target. Additionally, many modern scopes are designed for use with specific varieties of projectiles, not just models of guns (5.56 or 7.62 for example). A fairly common entry-level scope might provide a level of magnification that is 4x, however magnification levels of 20x or even 24x are not uncommon. During WWII, the German army began to experiment with night vision scopes. These are scopes that magnify the target while also allowing the shooter to see in very low levels of light. Some varieties of night vision scopes operate by magnifying ambient light, such as moon or starlight. While other, more advanced varieties operate on infrared technology, these actually detect body heat signatures and can work in complete darkness. Another sighting device that has become increasingly popular isn’t a scope at all, but a laser sight. The laser sight attaches to the barrel of a firearm and sends a concentrated beam of light downrange that allows the shooter to see where the barrel is being pointed. These are more effective at night, however they also limit your ability to remain concealed and also do not allow you to adjust for distance like a traditional scope will. However at fairly close-range combat these are excellent aiming accessories to add to any firearm. So how about we take a look at some different types of sights and scopes and see what’s what. 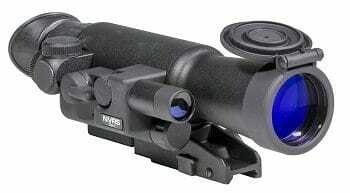 This is a fantastic scope that was designed with the 5.56 NATO round in mind. It will work well with other calibers of firearm, but it really is dialed in to the performance characteristics of that round. 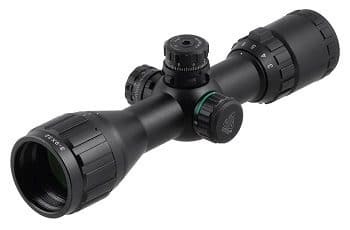 What makes this scope very effective are the open circle aiming points that are pre-hash marked from 100 to 600 yards, making sighting in your rifle with this scope an easier and more accurate process. As much as we all love sending some rounds down range, it’s a lot more entertaining when you’re sending them accurately into your targets and the P-223 will get that going quick and in a hurry. The P-223 is nitrogen filled with a sealed O-ring that prevents the insides of the lenses from fogging when you need them the most. 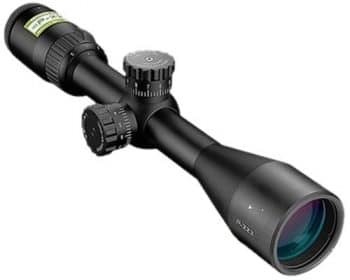 It has “turn and click” adjustment knobs that will make adjusting your scope easy and will allow it to hold its position accurately despite heavy firing. The UTG CQB is an awesomely durable and dynamic scope for any Picatinny or Weaver railed rifle. This scope is shockproof, waterproof and fog proof. It’s built on any incredibly durable platform that not only takes a beating, but also keeps your rifle sighted in just how it needs to be. Another awesome benefit of this scope is that it has an RGB side-wheel which allows you to adjust the level of light in the scopes reticle that allows you to easily see more effectively in low light conditions. We’re talking some serious nighttime zombie blasting capabilities here. This is a great all around 1st generation infrared night vision scope. It will mount easily to any Weaver rail rifle and from there it’s a night shooters paradise. The Firefield FF16001 magnifies ambient light and allows the shooter to see targets in the dark upwards of 200 yards away. This means you’ll be able to drop a crowd of zombies before they even know what’s hit them. Since this scope has electronic parts, it should be noted that it does require batteries and also that it is not effective as a daytime sight. You’ll need to dial it in and use it pretty much for night shooting only. That’s no big deal though, because it has a quick release capability that allows for easy scope switching without affecting you scope accuracy! 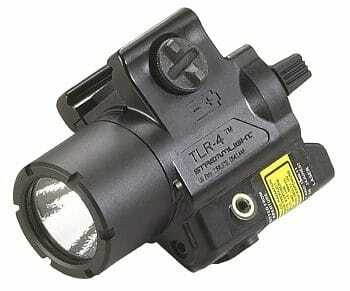 This little doozy of a tactical light/laser sight combo is a lightweight and durable shooters dream accessory. The aircraft aluminum construction of the TLR-4 makes hold up in even the most rigorous and demanding situations. It has ambidextrous mounting capabilities which means you can you use it to track down zombies right or left handed if need be. The tactical light cranks out 110 lumens of white spotlight action while the 660nm laser allows for some seriously long-range laser sighting. When you need to know what the hell just went bump in the night and then sight it in and shoot it down, there is absolutely no substitute for the TLR-4.